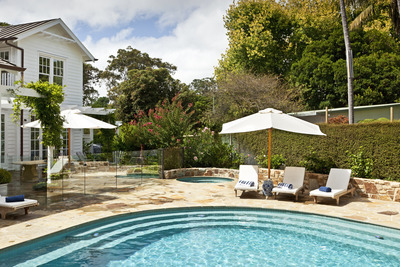 This Mornington Peninsula residential pool and spa was completed in 2011. The fully tiled pool is a beautiful water feature for the property, fitted with the latest technology to provide functionality and convenience at the client’s fingertips. The pool was designed through collaboration between landscape designer Robert Boden of Robert Boden Design PL, Aquarius Pools and the clients themselves. The owners of the pool wanted a large ‘Hollywood’ influenced pool for family fun, with at least one curved side and easy access to the water from various locations. The spa was also to reflect the pool shape and to be separated from the pool with a generous area of paving for sun lounges and entertainment. Design inspiration stemmed from the unique style of the house and the irregular block. The design echoes the character of the owner’s home. To meet the brief, two sides of the pool were formed in a large curve and full-length steps were incorporated as well as a long ledge for casual seating in the water. “Good design must incorporate the lifestyle of the client, functionality, site placement and high quality. This pool was to be situated between two buildings, both of traditional design, but set at different angles and in a garden area in which all the boundaries ran at differing angles. This meant the pool had to be designed in a completely abstract manner while fitting the requirements of the clients’ brief,” said Chris Jackson, Managing Director of Aquarius Pools. “The pool shape is not rectangular, however, it still affords a classic and timeless element. It was difficult to set out and construct but well integrated into the site. “We take into account the client’s lifestyle and future needs, with the aim of providing a lifetime of enjoyment from their pool and spa,” added Jackson. This pool and spa are fitted with the latest technology. The Pentair Intelliflow pump’s DC drive and variable speed provide significant power savings compared to traditional pumps. The Chemigem D10 chemical controller and Paramount PCC 2000 in-floor cleaning system allow for fully automatic maintenance. Other features include the Aqualink PDA in-house pool control system, which comes complete with a four-button spa side control, providing the ultimate convenience at the owner’s fingertips. A 36″ fibreglass filter and Astral Viron gas heater has also been incorporated. The spa is fitted with 7 amp Spa King blowers and Spa Electrics spa jets. The random stone paving was designed to meet the pool edge so that the formed coping was not apparent, making the space feel generous and allowing the paving to comply with the pool shape naturally. Stone garden walls complement the paving and link the house and the studio. The stylish, unique design of this pool and spa cleverly complements the irregular block. This pool won a highly recommended award at the 2012 SPASA awards in the category for ‘Best Residential Natural Pool’.